Last week I wrote about the Bechdel test, which asks a few basic questions about any given movie to begin evaluating feminine roles in film. Women, however, aren’t the only underrepresented and compartmentalized group in the mainstream American film industry. While modern laws prevent discrimination in workplaces and schools based on age, race/national origin/ethnic background, religion, sexual orientation, and disability, these traits are often generalized, overlooked, or denigrated in television and movies. The Bechdel test has started the conversation about under- and misrepresentation of women in the media, but we need to develop a test to discuss the roles that other groups that TV and movies relegate to one-dimensional characters. For women, we ask if there are two or more named women who talk to each other about something besides a man. What basic questions should we ask about people of color, LGBT people, and people with disabilities? Note that like the Bechdel test, simply having a nonwhite/LGBTQ/non-Christian/disabled character who speaks about something besides his/her “unique” trait doesn’t even begin to cover the range of complexities that comes along with being a human being, let alone one in the minority. Those three questions don’t include how a character embodies (or defies) stereotypes or how other characters treat him/her based on race/sexuality/religion/ability. 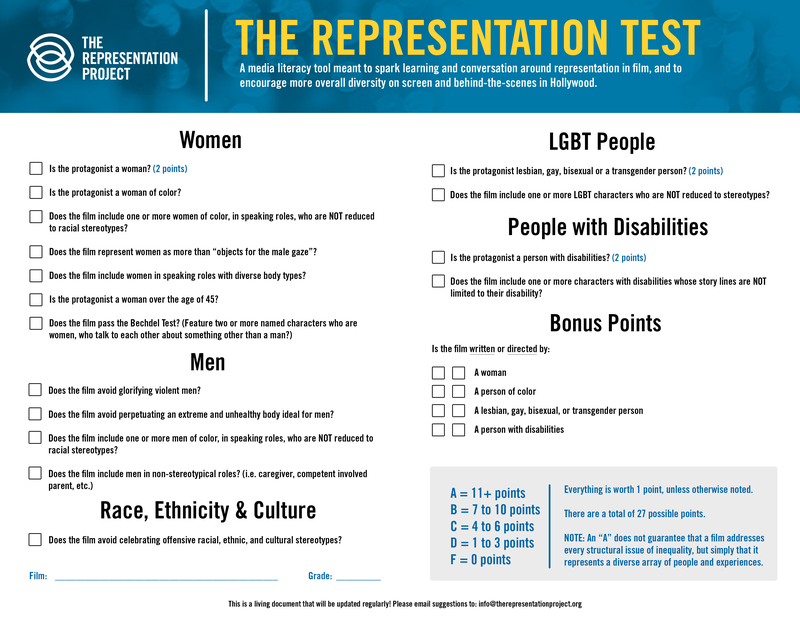 For this exact purpose, The Representation Project, an organization that aims to improve representation in the media, has created the Representation Test. It’s an extension of the Bechdel test that asks a handful of questions about a film and then assigns it a grade based on its representation of women, men, race/ethnicity/culture, LGBT people, and people with disabilities. Unlike the notoriously basic questions that the Bechdel test asks (and that I’ve correlated to other groups above), The Representation Test considers if characters are reduced to stereotypes. Representation in the media isn’t a simple issue, but it should be. I want to see movies and TV shows that better represent a cross-section of society, and that includes women, people of color, middle-aged and older adults, LGBT people, and people with disabilities. The film industry is perhaps the best place to begin addressing issues of inequality. To accomplish that, media representation of various groups needs to be deliberate, diverse, and accurate. Discussing this with my girlfriend recently, it turns out that quite a few bits of my work inadvertently pass the “Bechdal Test” even though I personally find it borderline tokenism, a box ticking exercise if you will. I create characters as people and the need of the story is paramount. I recently switched the gender of a major character in a novel I am working on. “He” felt flat and one dimensional with very little scope for development into areas not already being filled by other characters, yet changing the character’s gender opened up many questions. You’ve not been following my blog long so I am not sure if you know about my WIP about the six gladiators on a secret mission for Emperor Vespasian. The majority of gladiators were men so naturally I chose six men. Yet the more I looked into the phenomena of the gladiatrix, it made me realise I could add an extra dynamic to the plot. Most of the men who entered the arena were working class and broke, slaves, military deserters, prisoners of war etc… yet the gladiatrix was often a bored daughter of a senator with a lust for adventure and a rebellious streak. Changing the gender of a character definitely presents challenges, but I’m glad you’ve also found it to be exciting and expansive for your piece! You’re right that representation can become tokenism, and it’s an extremely fine line to walk. This is awesome, thank you for expanding the conversation! Glad you enjoyed! When I was researching the other piece I felt like I HAD to say something about other groups, but it wouldn’t have fit in the original piece. I’ve shared this on. Great article. I believe it’s much worse than this. NO ONE is represented in popular movies. They don’t “get” any kind of life outside of their Hollywood tropes. 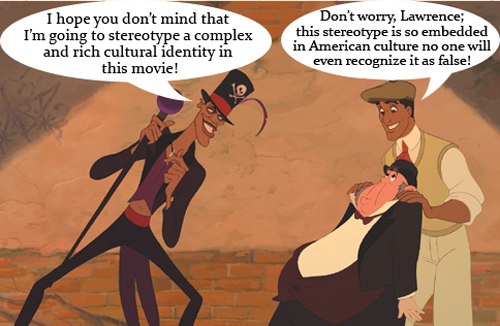 ALL people are reduced to stereotypes because Hollywood “creators” have lost all substance and creativity, and we the audience settle for it, and support their shallow, cynical vision with our dollars!